Below is the feedback from the students who attended SIGGRAPH 2003 in San Diego through the Spend a Week at SIGGRAPH program. The ACM SIGGRAPH Computer Graphics Pioneers sponsored the students. We’ve removed the students names and reformatted the text for consistency. Hi, I had a great time at SIGGRAPH. Thanks for sending me. I enjoyed seeing all the special exhibits. They were really cool. The food simulator actually felt like you were eating food except of course I was still hungry and the exhibit halls were really neat. They had great booths and free stuff. I enjoyed seeing the HP and EA Games booths. I learned a lot more about computers and how to make video games. That is something I am interested in right now. I attended everyday but Thursday and had a great time each day. I was by myself for the first day and the other days some friends of mine happened to be there. In total I was there for 5 days. 4 would have been perfect because after that you’ve seen everything. I was unable to attend the late night dinner and show. The tickets they gave me would have been better if it was for the afternoon show. I hope if this event comes up again I would be considered to go again. I didn’t know how much advancement in graphics there was until attending the SIGGRAPH convention. All I need now to maybe save up for some type of computer program that will give me The basic know how on how to start doing some gaming design or other types of graphics. It really did give me an incentive. The only drawback for the event is that food was expensive. By the time you bought a snack it was $10. So eating lunch was twice that. All in all I am glad that I went. I got great information and now know what else is out there in the computer graphics field. I now have information that I can look at and decide what fields I want to pursue in graphics. I had a lot of fun at Siggraph 2003. I Took some courses and i went to the Electronic Theater and Animation Theater. The Reception was great! I met my mentor on Monday. We talked about what i was going to do through the week. At the Electronic theater it was pretty fun. The animations were pretty nice.The one animation that i mostly liked was “Polar Bears: Gary’s Fall” by Passion Pictures. That was a real funny animation by Joanna Stevens. I went to the Animation Theater on wednesday right before the reception. “Cane-Toad” was the funniest and best animation i liked at the animation theater. I did watch the whole 3-4 hours of the animations at the animation theater. The course’s I took at siggraph 2003 were “Ther Can Be Only One: Independant Animation Production for the Lonely”, “Post-Linear Digital Video: Editing, Transcoding, and Content Distrubution”, “Advanced 3D Techniques”, “The Matrix Revealed”, and “Android Dreams: The Present and Future of Autonomous Robotics”.I also went to the “Art Gallery”, “Emerging Technologies”, “Guerilla Studio”, and the Exhibition. The first course i took which was “Ther Can Be Only One: Independant Animation Production for the Lonely” was pretty nice. I wanted to learn about animation production and how it was done. The speakers said that you would have to have a good idea of what you want your animation to be about before you can start. It takes alot of time for a animation production to finish. I think it was at least 6-9 months you would finish your animation production if you did everything correctly and if it was a great idea. The second course i took was “Post-Linear Digital Video: Editing, Transcoding, and Content Distrubution”. I took that course because i was going to be in Video Production next year in Mrs. Kueny’s class and i wanted to learn more about editing, transcoding and content distrubution of post-linear digital video. I already know ALOT about video editing and encoding but i wanted to know more about post-linear digital video. I think i learned alot from that course. I learned that you can have large amounts of monitors viewed at once with post-linear digital video. The third course i took was “Advanced 3D Techniques”. I took this course because i wanted to learn more about 3D. i was expecting to learn how to make 3D animation and stuff like that but i was wrong. I didnt really learn much from that course. My fourht course i took was “The Matrix Revealed”. I wanted to learn how they made The Matrix. The Matrix was the first movie that kind of inspired me on doing animation since it was so good. They did show the techniques they used to make The Matrix and it was pretty exciting for me to see all that. The fifth course i took was “Android Dreams: The Present and Future of Autonomous Robotics”. Robots are making the future better and better everyday and i wanted to know how they would be helping the world in the future. I learned that robots are being used in some movies like the Terminator 3 movies. Yes, i know those arent real robots but they are pretty nice since they make them look so real. They would be helping the world soon in the future and they have been helping the earth. Without robots the world wouldnt be were its at right now. Thats all the courses i took. I also visited the Art Gallery. I was amazed to see the quality of the pictures and the outstanding work. The pictures i mostly liked were by Victor Acevedo The “Nu Cynthesis” and “Davis Acevedo” pictures were just amazing to see. I dont know how he did those but he most have put alot of effort on those 2 pictures of his. I also checked out “Emerging Technologies”. I never knew that all these hi-tech devices even existed. Like a machine that puts out fog and you can see pictures through the fog and the airbrush painting was pretty kool. It would make my life easier if i had that heh. Guerilla Studio was pretty fun. it was hands-on stuff. Like playing on the computers on paint on the Apple computers and painting on the pen-painting notebooks. The exhibiton was by-far the best event there was at siggraph 2003 since there was big companys like Intel, AMD, Microsoft, ATI, nVidia, Sony, and univiersities like RIT. I did get alot of pens, cds, papers, and posters from the exhibiton since they were giving them out. The receptiong was great. I didnt talk to that many people but the food was great and there were alot of people there. Thats about it, This was the most fun i have had in 4 days. I did record some stuff at siggraph 2003 like a course and the reception and some of the exhibiton. If you want a copy of that video, i can mail one to you. Dear Mr. David Kasik, I would like to thank you for inviting me to the convention center. This was my first time going to a convention. I had a wonderful experience at the exhibition; it was my first time seeing a real computer the size of me. I also liked the emerging technologies. I just love seeing new cool things like that come out and see people be say, “WOW they just came out with a new Playstation 3”. I also loved the animation theater, even thought I thought some of the movies were creepy. I did not like any of the classes we took. They were very boring and some I could not stay awake. But I loved some of the tutorials that Adobe, Intel, AMD, and some other companies had. The last thing I want to talk about would be the electronic theater. I did not want to even go to it, because I was very tired. I want to say that I am so glad I went to it because the last movie they played was one of the best movies I have ever seen, it captured my heart. I now want to buy the movie that they played at the end. I was so happy that his art loved him as much as he loves them. It makes me very emotional just thinking about it. I think that movie should win an Oscar. But once again I want to thank you for letting me have this experience. Dear David Kasik, Thank you so much for giving me an opportunity to attend the convention. I learned about a lot of new things, one of which I still have a lot to learn about certain programs for moving making. During one of the coarseses I kept of asking myself, “What is a pixel?” In order to understand the whole class, I needed to know what a pixel was, and everything else was way over my head. My mentors helped me plan out what I was going to be doing the whole week, and explained to me where to go and what to do. They also told me that I could apply for certain colleges in photography, and showed me where the booths would be. My favorite parts of the convention was the emerging technologies, and the animation theatre. I loved the emerging technologies because they had all kinds of new things happening that I never knew existed. I also loved the animation theatre, it gave me some new ideas that I might want to do for some movies. The environment was a little chaotic, and made me dizzy at times, but it was interesting to see and meet all the different people that came to the convention too. I enjoyed my experience at the convention, thank you again for the opportunity. Dear David Kasik, I just wanted to start out by thanking you and my fellow mentors for giving us the opportunity to attend the Siggraph convention. It was an exciting experience, and I enjoyed every minute that I was there. I had fun learning about the up and coming technology and how it may affect our lives, as well the steps taken in creating digital animated movies. I must admit, when I first attended the convention, I was not that excited, but as I continued to view the exhibits and learn, my interest continued to grow. I learned that there is a great deal of layering involved in creating a digitally animated piece. Things are scanned into the computer, and designer’s ad there own ideas and layers to create what the directors ask for. I found the emerging technology room to be very interesting. There, I saw all of the ideas from individuals and companies. I never knew what we could do and what was really out there till I walked into that room. My favorite exhibit in that room was the tasting machine. As I bit down on the machine piece, different tastes were triggered, and it made me realize that possibly soon, we will be able to smell and even taste everything that we see in a movie. Now, that would definitely be a movie worth seeing! I also enjoyed watching the movies at electronic theatre. They were all very good, the Adidas movie was very interesting because they showed how they made those legs move so well. I wonder how much all of that costs? Anyways, I enjoyed the entire Siggraph convention abd I look forward to possibly even doing it again. Thank you for your time and patience. Dear David Kasik, I would like to thank you for the great opportunity of inviting us to attend the Siggraph Convention of 2003. It was an eye opening experience. I came into the convention having no idea what it was about and when I found out more about it I wondered why I was invited because all we did was make a film. In attending this convention though I realized the importance of animation in film. Nowadays there is not one film that doesn’t use some aspect of animation, or one magazine that does not use the elements of graphic design displayed. I learned that in my future films it might be nice to aspire to use some of these elements and make a film iup to par with some of the ones I viewed at Siggraph. Some of the curriculum was of coarse over my head but I guess you have to start somewhere. I sat in on a couple classes, and more so than learning at that point I was just observing. I admired most the people’s passion for what they do. I was told and had a couple of discussions with people and I learned that the field of digital animation is one that is big but due to the poor economy not one at the present fit for everyone. The exhibition was interesting mainly because I had never known how many different companies for animation existed. The way most people see it as they are watching a movie with animation is that it was done by the filmmaker, but yet their all a whole team of people behind it. I also really enjoyed the guerilla studio, it was a good hands on experience to many programs that I would have not otherwise been able to try. My experience was all tied together when I went to the animation theater and saw exactly what everyone had been learning about the whole time. They broke some of the animations down piece by piece so the viewers new exactly what the animators had to do. I enjoyed it thoroughly and had a lot of fun. I thank you for the opportunity and appreciate what you do so much. The five days I spent at Siggraph were full of learning and very thought provoking experiences. Each day I spent time learning about different subjects, from the professionals themselves, and got new perspectives on how each topic was done and thought about, as well as some information on how those individuals not only got to where they are today, but also how, even as one person, worked as a team to get a project done. The five days spent were very useful in achieving what I want to do in life, and not only that, but were very fun, and challenged me to think on a higher level, me being a teenager and not knowing too much about what a lot of these professionals were talking about, I had to raise my quota of learning and understanding to a new level, which also helped me and prepared me for my last year of high school in which I will be taking a course using computers, and some of this new technology that I was enlightened to. Each day there were many courses that were interesting, in which I was able to attend, my favorite being the modifications on already existing engines, such as the Half- Life engine, or the Unreal engine. I am very interested in that type of career, so this course was very useful to me, but also very entertaining. Other courses such as the one about IMAX theaters and projections was also thought provoking, on how they can get the image to spread across a very large screen like that, and the technology used to do that. The people teaching the courses were very helpful and understanding, they were patient and answered everyone’s questions. Each course was not rushed, and put together very well with both the speech and visuals to go along with it, making the presentations very understandable, educating, and very entertaining. The only thing I wish could have been provided was more information on how they got their education, but I do realize that most people there were already professionals, and did not need such information, however would have been helpful. While there I met many new and interesting people, ranging from all over the country, as well as all over the world. Each person I met was happy to share information with me about what he or she did, and how they do it, as well as how they got their education. The people I met made this experience much easier, taking time to explain some things to me about courses we were in, or on the exhibition floor, explaining how this new technology works, and how it will help us in the future. I met my mentor the first day, and although I didn’t see him much at the convention, because he was very busy, the information he gave me the first day was well enough for me to go out and journey the convention alone, and knowing enough to get by. My mentor was very informative, in both about the convention, and what he does for a living, and from what he told me, its no wonder that he was very busy at the convention. All the interesting people I met at this convention will forever have an impact on my life, I learned many things from them, and it will help me become a more knowledgeable person. Along with the courses and people, there was a virtual theater, which I went to Monday night, an exhibition hall, and an animation festival, which was shown all throughout the day. The exhibition hall had many new things that we are to see in the future, such as hardware, software, and things of that sort. It also had information on colleges, specializing in the areas that were presented throughout the convention. The animation festival showed works of animation professionals, ranging from comedies, to ones with a subliminal message hidden behind a cartoon, or just sad ones, which make you, feel sympathy for the character. All in all, this experience was very useful to me, and I’m glad I was given the chance to go. The things I was exposed to have changed my life forever, I’m now more intrigued by computer software and hardware, more interested in different areas of computer technology, as well as more willing to talk to people of those professions without being worried of not knowing what they are talking about. With all this new information, I’m very confident for my senior year of high school, in which the classes I’m taking using computer based technology, will not be as difficult as they would have been for me before. and waking up near noon — and then all of a sudden having to wake up at 6:30am and commuting to Downtown San Diego to attend a major convention is definitely a huge lifestyle switch, but I soon got used to sleeping early and waking up even earlier. Being an attendee at the Siggraph 2003 convention was possibly one of the greatest experiences I have ever had. While I was there I attended some courses and learned a lot of things about the CG process, met some very interesting people, and saw things that was just, in one word, cool. Sitting in a room full of people who are either professionals in the field, teachers and professors, or avid film and cinema students is very different than sitting in a high school classroom with students that would rather go home and play video games than listen to the teacher. The courses that I attended was “Fun & Games: An Introduction to Art-Based Game Modding”, “Introduction to Computer Graphics”, “Computer Graphics for Large-Scale Immersive Theaters”, and “Appreciation and Criticism of the Short Animated Film”. Attending those courses was actually very interesting. I learned many things about many different subjects of computer graphics and animation. Many of the speakers were very animated and made the hours of talking and talking entertaining as well. One thing that I did see during the courses that immediately think back to the high school classroom was scanning the room and seeing people asleep, drifting off, or drawing. The people that I met while attending the convention came from countless backgrounds and varied greatly in career paths. Some of the people I met, I was introduced to via my mentor, Geoff Wyvill. Through him I met some of his former students, partners in his work, and even an admirer of his work. I also met Andrew Glassner, who I was entertained by during his speech in “Introduction to Computer Graphics”. On my own, I had met some people during courses, during break, at the reception party, and even while taking time off to play computer games over the LAN and playing volleyball at Vortech in the Sails Pavilion. Talking and interacting with people who are active in the field of Computer Graphics had a very big impact on me, and at times, when I revealed to them that I was only a high school student, I had an impact on them. Some of the other things that I did while at the convention were Emerging Technologies, Guerilla Studio, and the exhibition. The Emerging Technologies exhibit was actually really interesting. One the exhibits that most caught my interest was the force-feedback painting pad, and the little finger thing with electrodes that allow you to feel lines on a paper (I don’t exactly know how to explain these things). The exhibition was really great as well. Seeing all the different exhibits different companies had was cool, and free handouts are always a plus. Guerilla Studio was fun because you were able to play around with the Wacom tablets as well as various CG software on the computers set up there. All in all, the entire Siggraph experience was just an amazing thing. I felt very honored to attend the convention, and I made sure to attend everyday. I would not have turned down this opportunity for anything. My life came to almost a pause during the week at Siggraph as I practically dropped everything else for the five days of the convention. 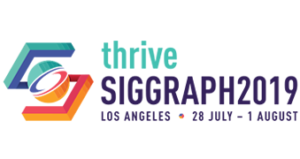 If I were given the opportunity to attend the Siggraph 2004 convention in Los Angeles, I would take the chance without hesitation. After being in that atmosphere and people for a week, it really made me feel the need to further myself so that I can work in a professional environment later on in life. Thank you for giving me the opportunity to attend the Siggraph convention.